Casa de Almendras is a south facing traditional Alpujarran cortijo that has recently been lovingly restored. The property has an abundance of Chestnut beams, white washed walls and hand-made terracotta floors. Some modern touches have been added, air-con in the living room, a well equipped hand-made modern kitchen and fast wireless internet. The property has stunning views of the SIERRA LUJAR mountains to the front and the SIERRA NEVADA to the rear. As late as April you can sit in the sun next to a tree dripping with lemons and in the distance see the snow capped mountains of the Sierra Nevada. A place of extremes, in the Spring some ski on the GRANADA slopes in the morning and drive 40 mins back to swim in the pool in the afternoon. The gardens provide plenty of opportunity to relax and recharge, beautifully landscaped with internal dry stone walls and orange, lemon, almond and olive trees. There are several large shady terraces of over 150 metres in total with comfortable seating areas and a 6 by 4 metre swimming pool filled with fresh mountain spring water. There is a utility room near the pool area with a second large fridge for drinks and ice, along with a barbecue for outdoor dining. 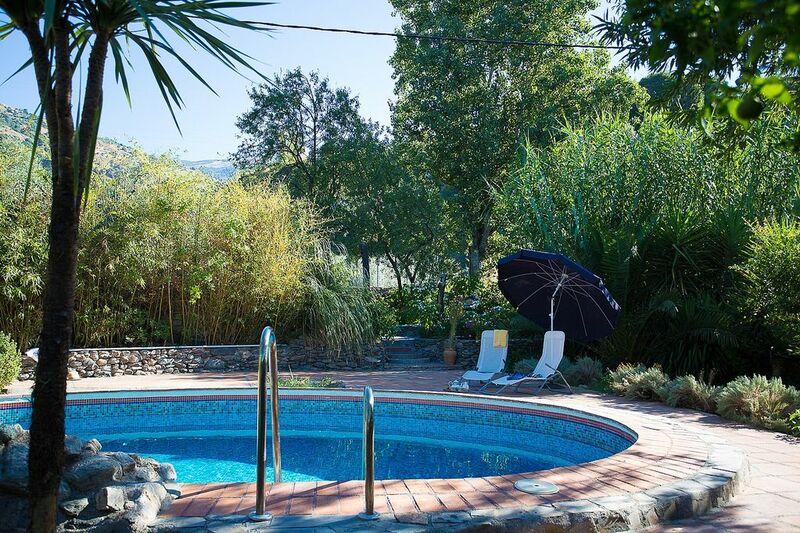 LAS ALPUJARRAS is an unspoilt region of Andaulcia with plenty to keep you occupied if you tire of sunning yourself by the pool. For those who want to abandon the car there's plenty to do right on the doorstep. The area is famous for its hiking, biking and horse riding trails. If you want to venture farther afield there's plenty to explore. A 20 min drive up the mountains to the famous white villages of Pampaneira, Bubion and Capileira - where artisans keep alive centuries old local crafts. There's lots of independent shops selling their wares, excellent restaurants and beautiful mountain walks. To the South, drive for 35 mins to the Costa Tropical - swim and watch a spectacular sunset. There's beaches for everyone including more secluded coves where it's a snorkellers paradise. The stunning city of Granada is a 40 min drive away. Wander around the Albaicin's maze of ancient streets, sample the tapas, visit the Alhambra Palace and indulge yourself at the luxurious Arab Baths. We bought the house in August 2013. We fell in love with the beautiful setting of the property and its stunning views. We spent 18 months renovating the house - summer 2015 was our first season. Hopefully we have created a home from home for ourselves and our guests. It's a fantastic location to explore the Alpujarras, the Costa Tropical and Granada. The views from the house are amazing and the gardens a joy to spend time in. The house is in a stunning rural setting, with beautiful semi-tropical gardens and private pool. It's not cut off though - a 10 minute stroll takes you into the small bustling town of Orgiva with its shops, bars and restaurants. The property is at the 'gateway' to the Aplujarras - so is perfectly positioned to explore this unique area. One family bathroom with a bath, shower, bidet and toilet. Large parking area. Can park in the shade under an Olive tree. Open plan living room with a dining area and a kitchen off it. There are two sofas, a TV, DVD, DVD, CD, IPOD Dock and WIFI. This room has air con - that can be used for heating or cooling. There is also a large wood burner for the cooler months. We have two fridges. One in the house and the other near the pool area with a large freezer. Gas hob - 4 rings. A well equipped kitchen with cooker, hob, fridge freezer, microwave, juicer & blender. There are two eating areas - one in the house and the other directly outside on a large terrace in or out of the shade. We have a dock that can be used for ALL mobile phones and a CD player. We have DVD's for guests. We are 45 mins by car to the ski resorts of Granada. No suitable for people who have problems with mobility. Notes on accommodation: There is air conditioning in the main living areas - this can be used for heating and cooling. In the bedroom there are fans for cooling. We only allow four guests as there is just one family bathroom. It does mean though that families with two children or friends can have their own bedrooms. Outside: The gardens are large and beautifully landscaped with several terraces that are both sunny and shaded. The gardens are large which means that guests can have privacy from one another as there are plenty of quiet areas for reading and relaxing. There is a large terrace at the front of the house for eating and a barbecue is provided. The pool is 6 metres by 4 metres. Please note it is not heated and does not have a shallow end - we do provide floats. By the pool there is a seating area with a comfortable large settee and table that is shaded and lit at night. The views from the gardens are magnificent. Utility Room: A separate utility room has a washing machine and a second large fridge freezer. Cleaning / Towels / Linen / Maid service: Towels are included. Linen is provided weekly for beds. The property is cleaned before (and after) the holiday. Additional maid service is available by arrangement but not included in the holiday price. We had a wonderful time at Casa De Almendras, where we stayed with our 8 month old son for 3,5 weeks. The house is beautifully restored and decorated and has a rural feeling to it. Nice beds. The kitchen is well equipped, however the blender and juicer could use a thorough cleaning as they were placed on an open shelf. The pictures do not do the garden justice. It was beautiful and well kept. The town of Órgiva is close by (10 minute walk) and has several little supermarkets and, amongst others, a Moroccan restaurant that we can recommend. Viv, the owner, has left a very nice guide to Órgiva and the surrounding area in the house. The bathroom has a bad sewer smell on and off, which does not disappear if you let the window open (as the gardener suggested, when we pointed this out to him). There’s probably not much to do about this. There are MANY barking dogs in the area and this takes a little getting used to. Of course not the owners’ responsibility. This is the third time we have stayed at this beautiful villa. We never fail to have a wonderful stay which is why we keep coming back! The gardens and its views are lovely. The pool is fantasic in the summer and the house itself is thoughtfully equipped with everything you could ever need. No doubt we will be back! A beautiful property with plenty of space, an enchanting garden and ideally situated for exploring the magnificent Sierra Nevada. We especially loved all the different areas of the garden that have been carefully landscaped with a wide range of flowers and fruit trees to provide sun and shade with maximum privacy and security. The house was clean and well equipped with everything you could need for a family or one or two couples. A short walk down an easy track provides access to a wide range of shops, bars and restaurants all providing excellent hospitality at very reasonable prices. We loved all the wildlife in the garden including birds and even a tortoise on the patio one morning. Our special thanks to the owners for their careful attention to arrangements for arriving at and leaving the property and the housekeeping team for the way the property and gardens are cared for. We were so very sorry to leave at the end of our 2 week vacation and look forward to returning. This was a beautiful and charming property in a great location. The restoration of the old cortijo is beautifully done, retaining some of the original features (such as the interior wooden beams) and adding all mod cons (including wi-fi and dishwasher plus a washing machine in an outbuilding). The decor and furnishings are simple and very tasteful, offering a cool and comfortable space. On the one day we had rain and were confined to the house, it was lovely to just sit and relax, listening to the rain and thunder and waiting for the lightning flash. It really did feel like a home from home – it has the feel of a place that has been lived in, a home that is loved. Every detail has been considered, everything we needed was there. The garden is beautiful and very well landscaped. Whether you want sun or shade at any time of the day there is a spot to enjoy – terraces, hammocks, lawns. And the pool is just right for an early morning wake-me-up or a mid-afternoon cool-down. The comfort and peace of the house is extended into the garden, it is a place that you want to be in, a haven that lulls you with its scents and colours and birdsong, with the view of the mountains adding an incredible backdrop. For us, above everything else, it was the garden that made this property stand out. There is a great deal of care and detail given to it and its use has obviously been considered in how it has been designed. Unfortunately, we were in the wrong season to pick fresh oranges off the trees ... but we could harvest the almond windfall. In terms of location it is only a 10-minute walk to the village, which is a pleasant little place to while away a leisurely lunch before returning to the hammock/pool/sun-lounger for a well-earned rest. And we discovered that turning right at the gate and heading up the track there is a nice little walk that runs along the (dry) river, passing eucalyptus groves. It is actually the end of one of the walks that is featured in Walk! The Alpujarras by Charles Davis (a copy of which is in the house), which would take you up to Carataunas and Soportijo and back down to the village, and it is right on your doorstep. We can't think of any negatives in any aspect – we had a thoroughly relaxing and carefree holiday and the property delivered on all that it promised, and more. Thanks very much for your fantastic review - we have tried to make the house a simple but stylish home from home - so your comments are much appreciated. And you obviously love the garden as much as we do!! Please do come again - early summer is pretty wonderful in the garden and there are lots of oranges! Wonderful time here with a garden and views that delighted us every day.Whilst very private and not overlooked it was not isolated and the town very easy to get to.We shall certainly return. Thanks Anne - looking forward to welcoming you back! On the outskirts of Orgiva, up a track and behind a gate is the beautiful house and gardens of Casa De Almendras. We enjoyed a week's holiday here - spending a lot of time (particularly our 2 teenage children) in the pool relaxing in the very hot sunshine. The garden is very large, exceptionally well maintained and all areas have been carefully considered to create spaces to sit and enjoy the views. We were able to pick lemons and almonds off the trees. The house had everything we needed and again wonderfully spacious for a family of four. The air con was very welcome relief in the 38 degree heat. This property is an excellent location with it's proximity to the pretty Alpujarran mountain villages, Granada and the coast. We were pleased with the high quality of food we ate in the restaurants of Orgiva and particularly enjoyed eating at Baraka Teteria, a Halal restaurant, great for our vegetarian daughter. A very memorable holiday - we'd love to come back! Pleased you had such a good time - and enjoyed cooling off in the pool. You would all be welcome back anytime. Thanks, Viv and Chris. The area is famous for its walking trails, horse-riding and cycling. The property is a half hour drive away from the Costa Tropical where there are many unspoilt and family beaches. Malaga is 90 Kms away. A car is essential. The house is a 10 min walk or 0.5 km to the nearest town of Orgiva. It is an ideal place for an exploration of this unspoilt area. A 20 min drive up the mountains takes you to the famous white villages of Bubion and Capileira. 45 minute drive takes you to Granada and the famous Alhambra Palace. The city is also fantastic for shopping, strolling and sampling delicious tapas. In the winter there's great skiing. In the opposite direction is the Costa Tropical with beautiful beaches. We have a comprehensive website that has a restaurant guide and things to do in the area. Please do take a look - there is a wealth of things to do in the area. Booking Notes: We like our guests to pay 30% deposit on booking and the balance to be paid no later than one month before the holiday. MEET AND GREET - Guests will be greeted by SERGIO and CELIA - a young Spanish couple who look after the house in our absence. Sergio is in charge of the garden and general maintenance and is available if there are problems during your stay. Celia is the house-keeper and will do additional cleans during your stay. Casa de Almendras is a licensed tourist let VTAR/GR/00972 Changeover Day: Our preferred changeover day is Saturday. We ask guests to Check Out before 11am as the housekeeper needs to clean the property for the next guests. Check In is after 4pm and before 10pm. If you are arriving later please check before booking with us that we can arrange your meet and greet.